No matter the occasion, pie is always a welcomed dessert. Experience baker Sherry Gore shares her tried and true methods for baking perfect pies in her newest cookbook, Me, Myself and Pie. Whether it's a farmhouse chicken pot pie or a classic apple pie, Gore has a recipe that is guaranteed to please. 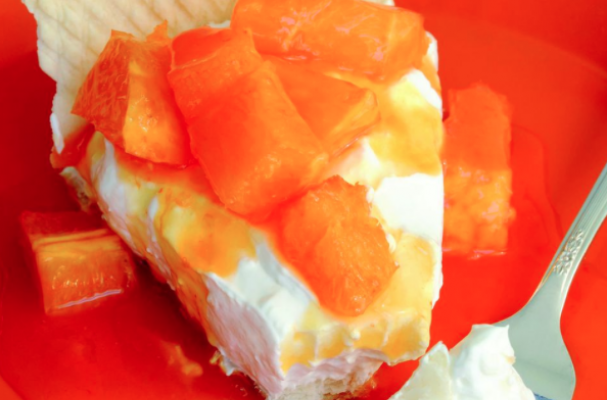 If you are new to piemaking, this orange pie is a great recipe for beginners. The combination of the zesty orange flavor with tangy cream cheese and the buttery pie crust is perfection. This is a great orange colored treat for Halloween or fall. To make this delightful dessert at home, see the recipe below. This is the pie I want in heaven, a delightful concoction as bright in color as it is in taste. The surging burst of citrus combines with a tender, flaky crust and smooth filling—a true epiphany! To prepare orange filling: Bring 1 1/2 cups of water to a boil in a saucepan. In a bowl, mix together sugar, cornstarch, and drink mix. Add 1/2 cup of water into the sugar mixture and stir. Pour into boiling water, reduce to medium heat, stirring as it cooks. Remove from heat when it begins to thicken a bit. Cool. Stir in orange pieces. To prepare the cream cheese mixture: In a bowl, stir together cream cheese and confectioners’ sugar until creamy. Add half of the whipped cream to the mixture. Spoon into baked pie crust. Top with orange filling. Refrigerate overnight. For the garnish: Decorate the top of the pie with the reserved whipped cream, if desired. This flaky and decorative crust is a mainstay of the pie world. Often it seems that as the crust develops so do the skills of the baker, so when you finally perfect this recipe, you will have reached a level of true artistry—a Piecasso is born. Blend flour, sugar, and salt well in a large bowl. Cut the shortening into pea-sized pieces and work into flour mixture until crumbs form. In a separate bowl, mix together cold water and vinegar. Gradually add the water mixture to the flour mixture until combined. Shape the dough into a ball, cover in plastic wrap, and chill for at least 30 minutes. On a lightly floured surface, roll out the dough to a uniform thickness. Place in a pie plate and trim the edges. Bake at 400°F for 8–12 minutes, or until golden brown. Let cool. Makes two 9-inch pie crusts.